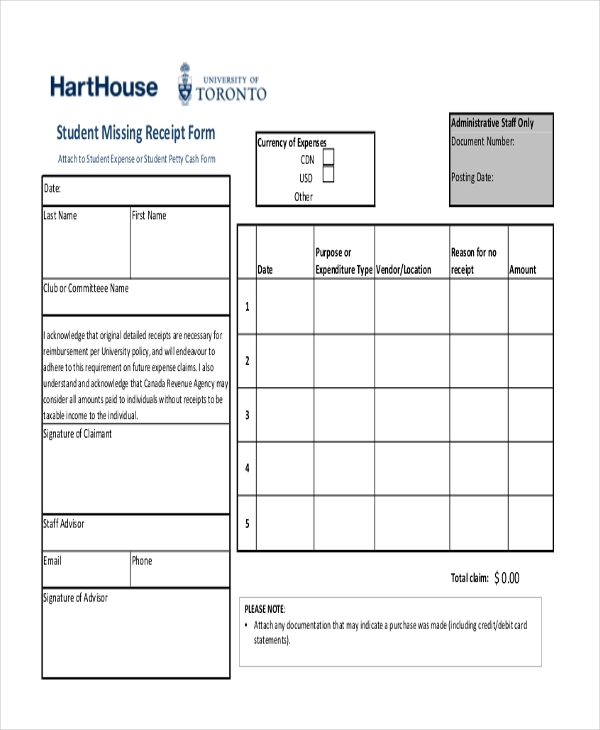 This form is used by the students or their families to request the issue of a duplicate receipt, when the original receipt of any transaction goes missing but is needed for certain purposes. As the name indicates, this missing receipt form is used by a person like a vendor or a contractor who may have lost his procurement card. By filling this form, he can request for a new card. 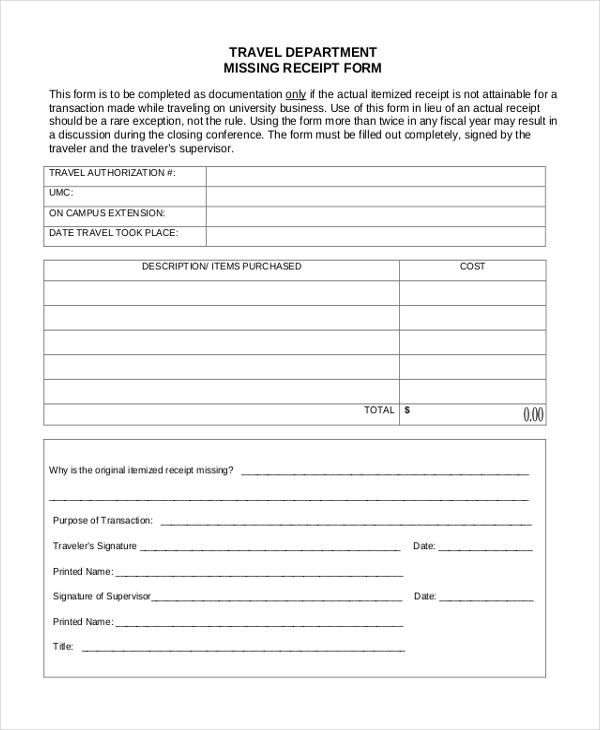 Generally used by the client of a travel department, this form helps him to raise a request for issuing them a secondary receipt when the original receipt which indicates his transaction goes missing. This form is used in business organizations. It is used by the employees to raise a request with the management to issue them a duplicate receipt for expenditures rendered by them for the company. 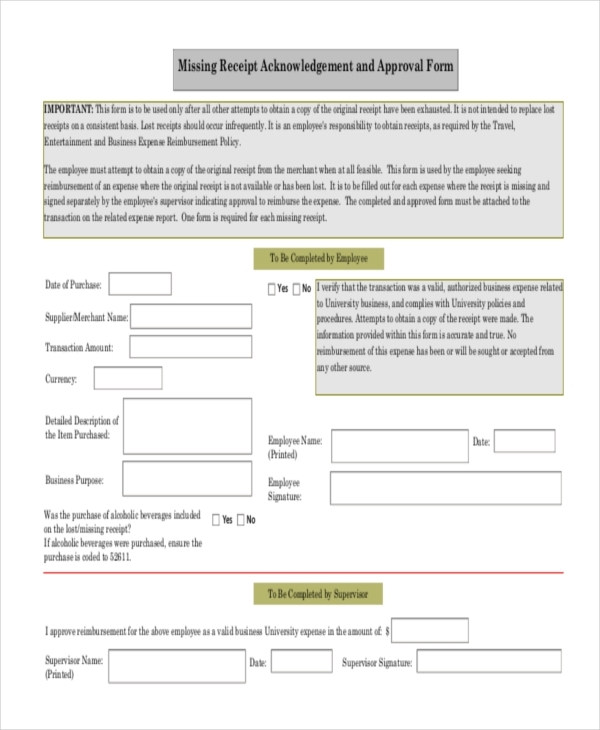 As the name suggests, this form is used by a person to make the concerned authorities aware of the fact that he has lost a receipt that would have been useful for him. This helps him to gain a copy of the original receipt. 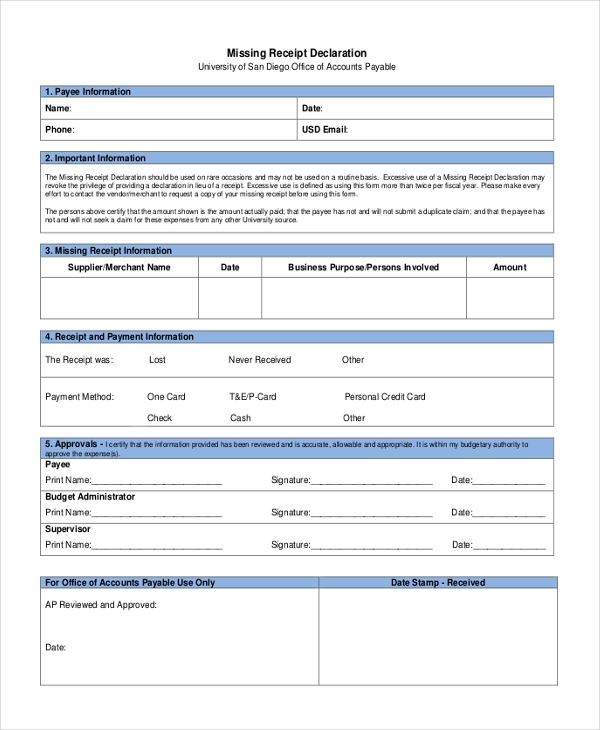 Used by the staff of a company or service organization, this form helps them the request for a copy of the original receipt which was given to them when they spent money for the company needs. On losing the original they may find it hard to get a reimbursement which is why they would request for a duplicate. 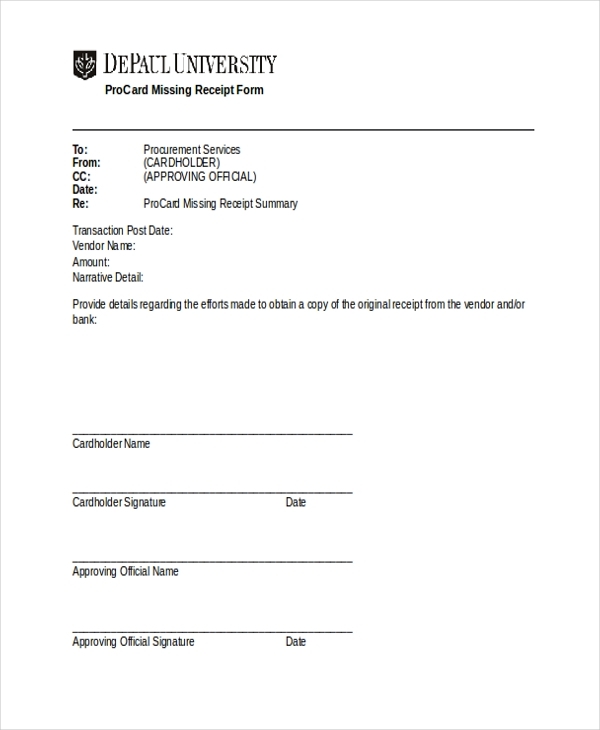 Used by the students or other employees of a university, this helps them to raise a request to attain a copy of an original receipt which may have been issued to them from the university office. 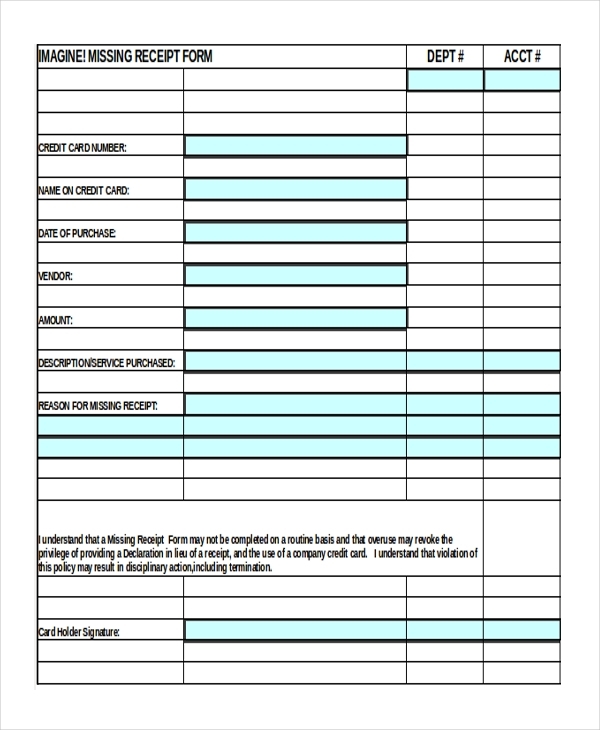 The person is required to fill in some of the details of the original receipt in this form. 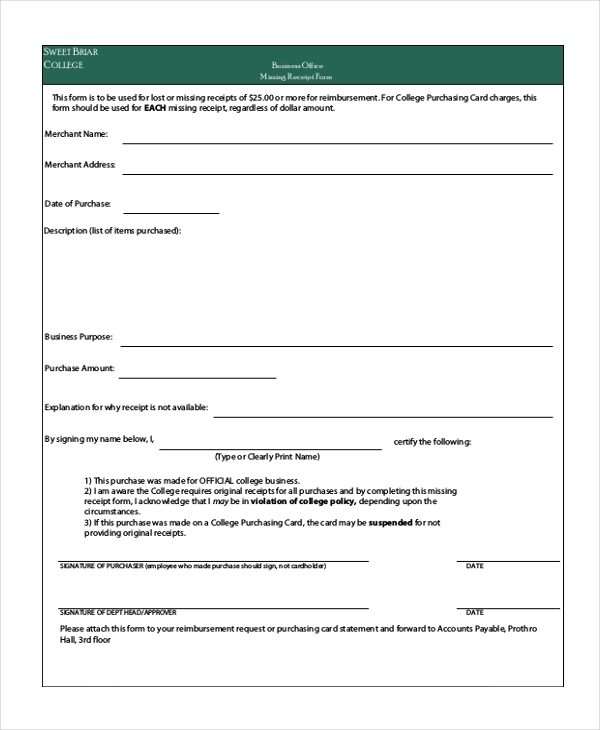 This form is usually used by the employee working in the purchase department of a company when he loses or misplaces his purchasing card. By filling and submitting this form, he can request the management to issue him a new card. This is a standard design of how a receipt form should look. It contains all the important columns and subheads that should be part of such a form. A user can use it just the way it is or can make necessary changes as per his needs. 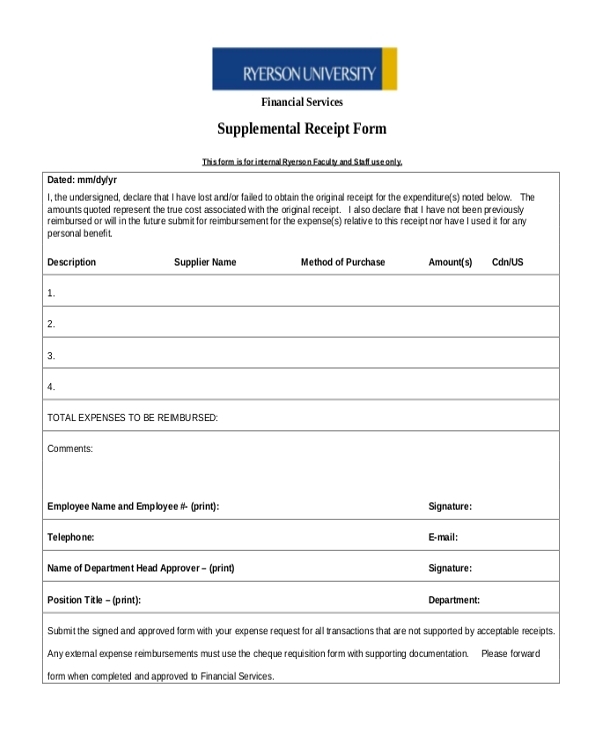 Used in business organizations and other institutions, this form helps a person to raise a request for a reimbursement when the original receipt is missing. By adding in the details and reason for the missing receipt, the person can gain the reimbursement or copy of the receipt. When should a Missing Receipt Form be used? What are the Benefits of Using a Missing Receipt Form? 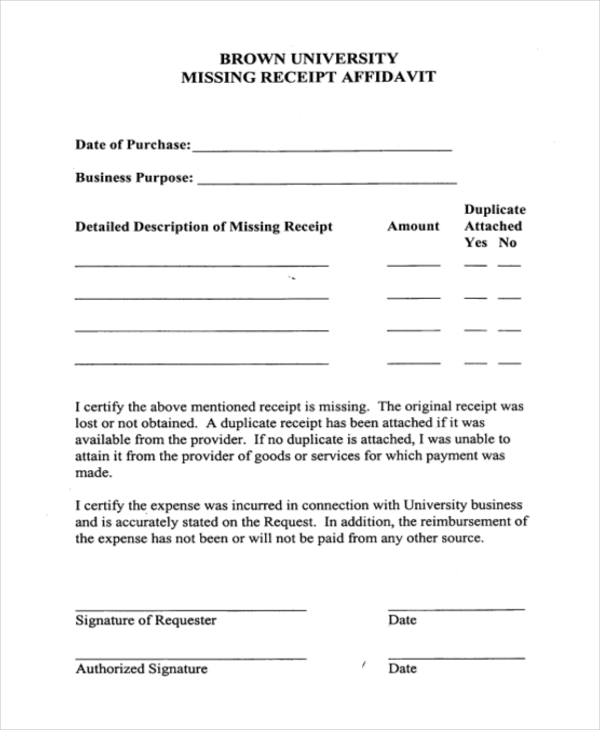 A missing receipt form acts as a genuine request by a person to the higher officials to issue him a copy of the original receipt or to grant him the benefit that he may have acquired by producing the original receipt. The authority concerned can save these missing receipt forms and store them in their records, which may come in handy at the time of annual audit. The missing report form gives the concerned authority a clear idea about how the person lost the receipt and what he intends to do with the copy. How can you Design a Missing Report Form? A missing receipt form can really help a person when he loses the original receipt and thus should be a part of all organization offices. If you do not have enough time to design this form, you can find a perfect one by browsing through the vast collection online. Easy to download and customize, you can design these as per your requirement.